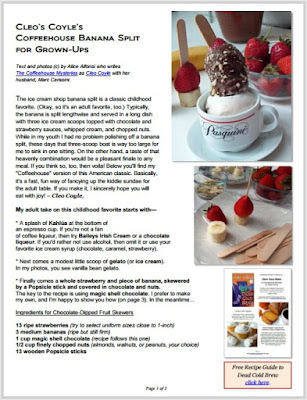 Behold my "coffeehouse" version of the classic American banana split: a fun, fast way to fancy up the famous kiddie sundae for the adult table. 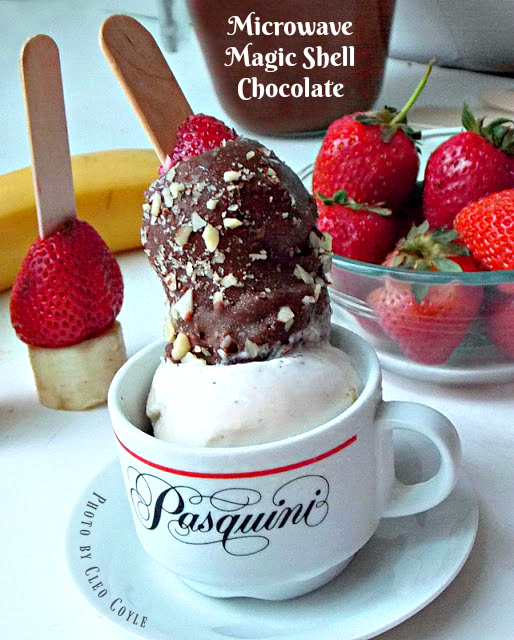 My post not only shows you how I make this beautiful "dinner service" presentation, but also gives you a recipe and tips for making your own magic shell chocolate--a great way to create chilly chocolate treats for summertime eats. 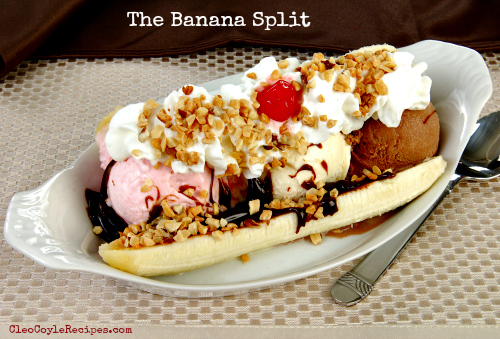 The history of the banana split dates back to 1904 Latrobe, Pennsylvania, where a 23-year-old apprentice pharmacist (who enjoyed inventing ice cream treats at the pharmacy soda fountain) first came up with the banana-based, triple scoop sundae. While in my youth I had no problem polishing off a banana split, these days that three-scoop boat is way too large for me to sink in one sitting, especially after a full meal. If you think so, too, then voila! 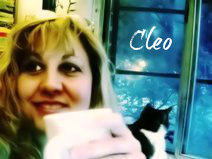 * A splash of Kahlúa at the bottom of an espresso cup. 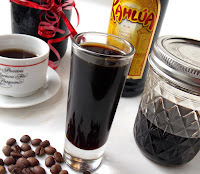 If you're not a fan of coffee liqueur, then try Baileys Irish Cream or a chocolate liqueur. If you'd rather not use alcohol, then omit it or use your favorite ice cream syrup (chocolate, caramel, or strawberry). * Next comes a modest little scoop of gelato (or ice cream). In my photos, you see vanilla bean gelato. Step 1 - Prep and chill fruit: Remove the green stems from the strawberries and gently hull them. (For a quick lesson on how to hull strawberries, click here.) Cut bananas into 1-inch pieces with flat ends. (Do not use pointy banana tips.) Place all of your prepared fruit pieces into the freezer for at least 30 minutes, but no more than an hour. This will help prevent the fruit pieces from splitting in the next step. Step 2 - Make your fruit skewers: With a paring knife, cut a shallow slit on the bottom (pointy) end of a chilled strawberry. With a firm grip on the berry, gently push the end of one Popsicle stick through it. Keep pushing until you see the stick protruding out the top end of the berry. Gently spear that end downward, into (but not completely through) a piece of banana. The little fruit skewer should now be able to stand upright on your plate (as in my photos). Troubleshooting tip: If you can't get it to stand up, you probably have too much of the Popsicle stick pushing through the banana. 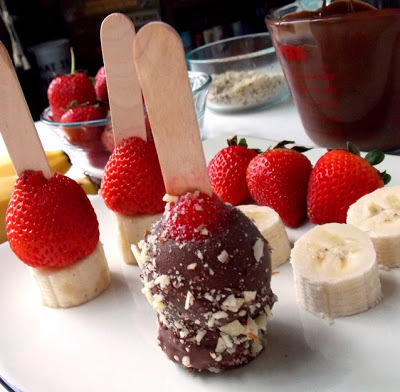 Adjust the fruit along the stick so the flat of the banana is on the plate and not the end of the Popsicle stick. Step 3 - Re-chill: Once all the fruit skewers are finished, return them to the freezer for another 15 - 20 minutes to chill them up again. For instructions on making magic chocolate, go to the end of this recipe. Step 4 - Prep plate: Cover a plate with plastic or aluminum foil. If you don't, the chocolate may stick to the plate. 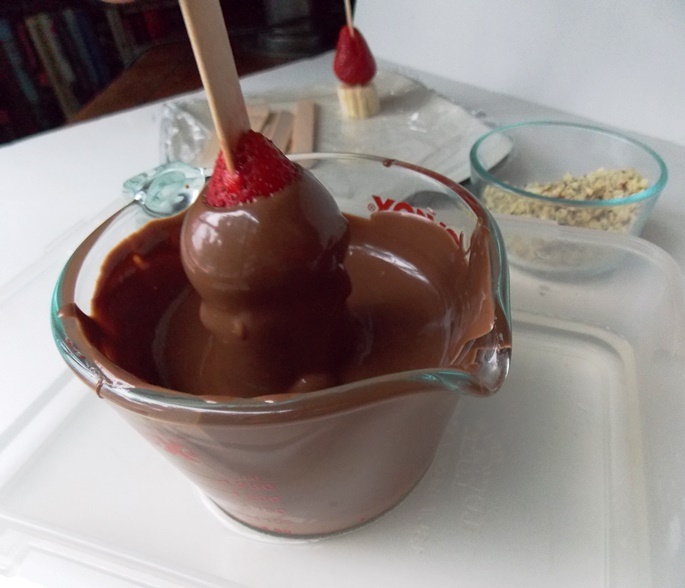 Step 5 - Dip, sprinkle, and chill: Gently dip the fruit skewers into the warm magic chocolate. As you pull it out, allow the excess chocolate to drip off. Sprinkle with chopped nuts and stand it on the foil- or plastic-covered plate. When all of the skewers are finished, place them in the refrigerator or freezer for 10 minutes to set. STORE: You can keep the finished skewers in the fridge for many hours before dinner or even the day before. Or you can wrap them gently in plastic or foil and keep in the freezer for two to three weeks. Although many versions of this basic recipe are posted all over the Internet, the original source appears to be award-winning Chef Thomas Keller. I adapted his version, using a microwave and chocolate chips. The secret to this recipe is the extra virgin, cold pressed coconut oil, which liquefies around a modest 76 degrees F. yet firms up fast when taken below that temperature. That's why you'll see a chocolate shell form quickly if you drizzle it over scoops of ice cream. 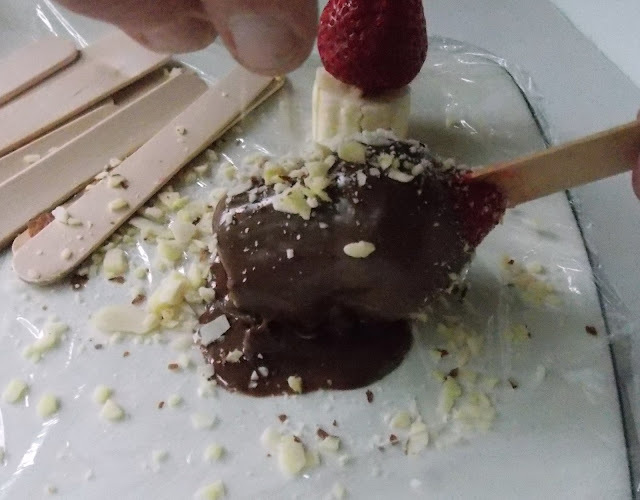 Likewise, for my "Coffeehouse" Banana Split recipe, once the fruit is chilled and dipped, you can place it in the fridge and watch a shell form very quickly. *Chocolate chips can be milk chocolate, semi-sweet, or dark (bittersweet). In my photos, you see milk chocolate chips. **For the best quality coconut oil look for "extra virgin, cold pressed" on the label. For a fast tutorial on what kind of coconut oil to purchase (and which I use and why), see my past recipe post, here. Directions: In a microwave-safe container, stir together chocolate chips and coconut oil. Microwave for 15 to 20 seconds and then stop and stir the chips. Chocolate burns very easily so be sure to heat the mixture in short intervals. Return the container to the microwave for another 15 to 20 seconds. Stir again until chocolate is melted and smooth. This mixture is now ready to use in the above recipe or you can drizzle it over very cold ice cream and the "magic" shell will quickly form. The chocolate should stay in its liquid form unless chilled. If the mixture begins to solidify, return it to the microwave for 10 to 15 seconds and stir until melted and smooth once again.